Most orchid growers begin their collection with cymbidiums. Then, seeking broader horizons, they branch out into zygopetalums and Australian native dendrobiums and sarcochilus. At this point, they begin to look around for other genera that they can grow outdoors in Melbourne. Two that I strongly recommend are coelogynes and stanhopeas. Not all coelogynes will survive outdoors in Victoria, but there are sufficient of the 200 species in the genus that will flourish here without heat to satisfy most growers. 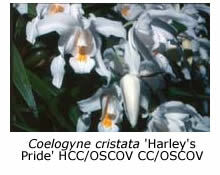 There are also a few coelogyne hybrids, but these are not as readily available as the more common species. 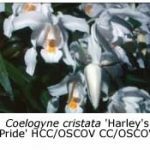 Coelogynes are Asian orchids, which range from China in the north, through the Himalayas and down to the Philippines and Indonesia. Many Indian species grow in the Himalayas and the Khasi Hills; most of those found above an altitude of 1500 m (5000 ft) should grow in a shade-house in Melbourne, provided that it is protected from rain and cold winds in winter. I grow several of the species that I am about to recommend, but have no experience in growing some of them cool. Having a heated glass-house, I tend to grow as many orchids in it as will fit, because they receive slightly better attention there than elsewhere. Generally an orchid gets ‘kicked out’ only when it grows too large or if it fails to flower. Sometimes they flower when moved outdoors; sometimes they die instead! Two coelogynes that I have personal experience in growing outdoors are Coelogyne cristata and C. mooreana. There is no doubt in my mind that they grow and flower better outdoors than in a heated glass-house! Some of the coelogynes which should grow outdoors in Melbourne, based on the altitude at which they are found in India, are C. barbata (1300-1700 m, white flowers, 70 mm wide), C. corymbosa (2000-3000 m, creamy white, 60 mm), C. cristata (1700-2300 m, snow-white, 120 mm), C. flaccida (1000-1700 m, cream, 20 mm), C. graminifolia (1300-l700 m, white, 50 mm), C. nitida (1000-2000 m, white, 50 mm), C. ochracea (1700-2000 m, white, 20 mm) and C. ovalis (1300 m, yellow-brown, 25 mm). The last, found at 1300 m, may be a marginal case for outdoor culture but it has the attraction of flowering in late autumn, whereas the others flower mainly in spring or early summer. Some species, such as C. mooreana and C. tomentosa, may flower several times during the year. The latter, found in Assam (altitude unknown), grows well in a shade-house in Melbourne, and carries many straw-yellow flowers on pendulous racemes. The climate where the above orchids grow provides us with a good indication of how we should cultivate them. The summers in their natural habitat are humid and very wet. Annual rainfall of 2.2 m (75 in) is not unusual, most of it falling in summer. Winters are dry and cool. 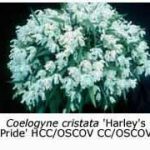 Coelogynes should therefore be heavily watered and fertilised in summer, but watered much less (certainly not more often than weekly) in winter, and given no fertiliser then. The pseudobulbs may shrivel a little by the end of winter, but they soon recover their plump appearance when growth resumes in summer. The difficulty that some growers have in flowering C. cristata is usually due to their failure to allow the plant to ‘rest’ by withholding water during winter. Coelogynes seem to grow well in a variety of potting mixes, provided that they are well drained. Pine bark, with or without the various additives that some cymbidium growers incorporate, is quite satisfactory. 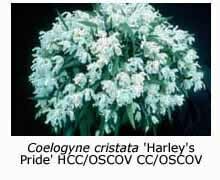 However, coelogynes dislike being repotted, and hate division! They are best repotted immediately after flowering, when new growth is about to begin. Even so, they may sulk for some time and not flower the following year. Care must be taken when making divisions to ensure that each piece has sufficient roots to support it. In many cases, there are no roots at all on the last three years’ growth. The two most spectacular species, in my opinion, are C. cristata and C. mooreana. Occasionally one sees huge specimen plants of C. cristata in which the semi-pendulous spikes of snow-white flowers almost obscure the foliage. It is the most common of all the coelogynes in Melbourne, and no grower should be without one or more. There are two forms – one with closely clustered, spherical pseudobulbs, and the other (var. maxima) with more widely spaced, elongated pseudobulbs – but the flowers on each seem to be identical. There is also a variety lemoniana, in which the keels on the labellum are yellow, rather than the usual orange. The crystalline-white flowers of C. mooreana, which was originally found in Vietnam, are different but equally spectacular. They are held on upright spikes which emerge from the centre of the new growths. This orchid is not as widely avaliable as C. cristata but is now gradually becoming more common. If you can find a grower willing to sell you a division, don’t quibble at the price – it will be worth it!